A friend’s life is falling down around her ears. It hits me hard, this dismantling. I feel helpless as I watch the wrecking ball crash into buckling walls. Beautiful rooms dissolve into dust. I'm inadequate in the face of such pain and fear. by their imperfection and insufficiency. So I take her hand, and we pray. Begging God to be in this mess. I glance down at our skinny hands, clasped together like a knot. And I realize that, in the end, that is what friends do. We hold hands in hospital waiting rooms. We hold hands when divorce papers are served. 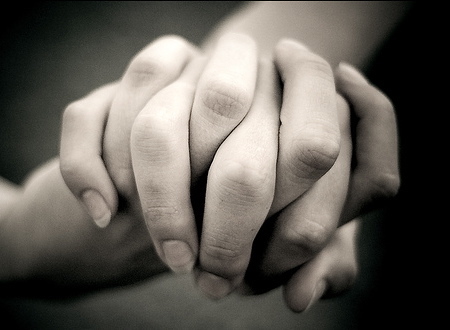 We hold hands when the diagnosis is given. Sometimes it’s the only thing to do. The best thing we can do. In our media-obsessed world, contact between human beings becomes ever more impersonal. We are afraid to touch each other. To get too close. Maybe we’re just afraid of germs. We might catch something from another person. We could catch their fear or their pain or their heartbreak. But human beings need flesh on flesh and skin on skin. When I touch you, I connect with you. I feel the pulse in your cold hand. I feel the life. And I mingle it with mine, in our clasp of hands. The ancient Celts had a custom called hand-fasting. In wedding ceremonies, the couple’s hands were tied together with an endless knot. the Bride of Christ, his body, is knotted together in love. I will hold your hand in the dark, my friend. (p.s. Did anyone notice that I made a Freudian slip in the previous post? In the champagne incident, I wrote ‘deviance against the Forces of Evil’ instead of defiance. This has nothing to do with your post, except tangential hand holding. 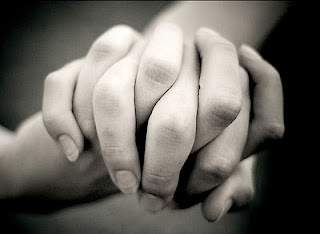 We do pray for other people, people we have never met or know peripherally, and I think this is a form of hand-holding. It isn't the physical, tangible comfort of another soul joining yours, but the God augments the soul stretch of distance, I think. Some of the random moments of peace that we are graced with, I believe, are another person's prayers and well-wishes being communicated to us by God. Kim, thank you so much for not only this post, but many others. Your writings always seem to touch the deepest places of my heart, even though our situations are different. This post really challenged me in the area of my friendships. I hate to admit that I am sometimes not a very good friend...I tend to run from the awkward, uncomfortable, painful times of my friend's lives (as well as my own). But this encourages me to "hold your hand" as God holds mine. PLUS, it contains a song by the awesome band Mumford & Sons! Can't get any better than that! "Some of the random moments of peace that we are graced with, I believe, are another person's prayers and well-wishes being communicated to us by God." I love this...and so true, Laurel. So true. So true. I hope one day we have the opportunity to "hold hands." Until then . . .
How interesting that you wrote this post! Because I have one friend who always holds my hand after she greets me in church - and sometimes doesn't let go for awhile. I admit I have often felt awkward and haven't known why? After reading your post, I am going to try and be more present when this happens and enjoy the connection. Thanks always for your thoughtful writings. God speaks to me through them. Kim, I always love reading your posts. They are eloquent, thought-provoking, and insightful. Sometimes I return again and again to chew on words that have resonated with my soul. This one is particularly pertinent as we face the challenges and repercussions of raising our kids in this hands-off world of modern media. What a challenge it can be!